The white sandy beach at Mushroom Bay. During the day, the tranquillity is occasionally interrupted by parasailing or banana boat rides. You should make sure to check out Jungutbatu Beach too – clear blue water that goes forever and you can enjoy superb views across the bay to Gunung Agung. Tantalize your senses as the rough waves crash against the cliffs and spray the tops of the palm trees. If you like to dive you won’t be disappointed while in Nusa Lembongan as there are plenty of good dive sites in the area. There are many landmarks and monuments to check out. The sacred tree, the lighthouse, and you must also be sure to take some time to explore the incredible shrines, intricate temples and gates in the area. The elaborate stone entrances will captivate you whether they are small or large. The temples will mesmerize you. There are some great opportunities to enjoy some local cuisine here and of course, if western cuisine is what you really want, you can have that too. There are a number of restaurants and bars. Come for a meal or just to kick back and enjoy your favourite drink. You also find that Nusa Lembongan villas are very affordably priced. In fact, you can find a state of the art, luxurious villa, even if you are on a budget. Private swimming pools, spectacular views, a sanctuary all unto its own to awaken your senses. A place to relax after a busy day of tourist activities. If you are excited about your Bali vacation but are still seeking that ‘best kept secret,’ this is it – you’ve found it. 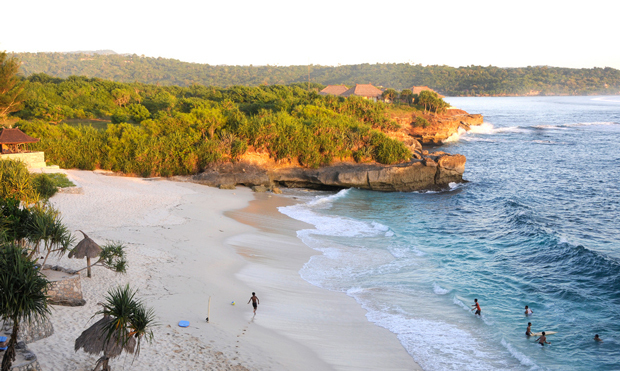 Nusa Lembongan won’t disappoint, it is a special place. Come stay awhile – come play!